The state of Punjab is located in the northwestern part of the Indian subcontinent. The state forms a part of the larger Punjab region that includes the province of Punjab (Pakistan) too. Punjab (India) shares its borders with Punjab (Pakistan) on its west, Jammu and Kashmir on its north, Himachal Pradesh on its northeast and Rajasthan on the southwest. Punjab, meaning the 'Land of Five Rivers' is named after the rivers the Jhelum, the Chenab, the Ravi, the Beas and the Sutlej. Sikkhism is the main religion in the Indian Punjab, forming around 65% of the total population. 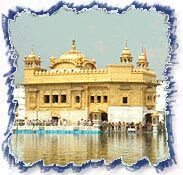 The state is particularly known for its splendid Golden Temple, located in the city of Amritsar. Summer extends from March to June and Punjab can be as hot as 48 degrees during this period. July to September is the time of the monsoons. The annual rainfall in the sub-mountain region records 96 cm while in the plains it is 58 cm. Winter begins in December and continues till February, with temperature dropping down to as low as 0 degree in the month of January. Amritsar, the second largest city in Punjab, is internationally renowned for the Golden Temple or Harimandir Sahib. Amritsar is the very city where the horrible Jallianwala Bagh massacre had taken place. Other tourist attractions of the city include the Durgiana Temple, Rambagh, Ram Teerth and Taren Taran. Chandigarh, the capital city of Punjab, is known for its modern architecture and planning. The city offers hordes of attractions like the Rock Garden, the Tower of Shadows, the Open Hand Monument, the Sukhna Lake, the Leisure Valley, the Rose Garden and the International Dolls Museum among others. Known as the 'Manchester of India', the city of Ludhiana is popular for hosiery and woollen goods that are exported all across the globe. Major tourist attractions are Gurudwara Shrimanji Sahib Alamgir, Pir-i-Dastgir Shrine, the Phillaur Fort, the Bilwanwali Masjid, the Gurudwara Charan Kamal etc. The city of Patiala is unique in its own right. It offers tourists the much sought after tranquility, far from the hustle bustle of the cities. The city is popular with the tourists for its delicious food and warm people. Peg and Jutis of Patiala are no less interesting. Jalandhar (previously Jullundhar) lies at a distance of 80 km from Amritsar, the 'City of the Golden Temple'. Believed to be the oldest city of the state, Jalandhar is today a major industrial centre of the country. Here, Phagwara and Kartarpur are famous for cloth manufacturing and export of quality furniture respectively. The major airports are located at Chandigarh and Amritsar. The Indian Airlines and the Jet Airways operate regular flights to the key destinations of the country. The capital city of Chandigarh lies at a distance of 246 km from Delhi. Chandigarh, Amritsar, Ludhiana and Ferozepur are the major railheads in the state and there are daily trains from these cities to New Delhi. By express trains, it's a three-hour journey from Delhi to Chandigarh while Delhi to Amritsar is a distance of six hours.